Software development traditionally has been a field particularly prone to delays, exceeding budgets, and misunderstandings (May 1998; Connel, 2001; Humphrey, 2002; Goodwin, 2002; Kesteloot, 2003). Only 1/4 of IT projects is completed successfully – i.e. in time, with the assumed cost, and fulfilling the promised functionality (Smith and Keil, 2003). Although there is some improvement over the last years, software creation is still one of the most unpredictable businesses in the world. It should not be surprising then that high-tech environment often is described as stressful an demanding (Kunda, 1992; Hochschild, 1997; Perlow, 1998; Cooper, 2000; Jemielniak, 2005). It is the nest of the so-called normative control: management by indirect reign, through the means of evoking motivation and dedication of the employee, rather than physical direction and supervision (Kanter, 1977; Mintzberg, 1998). On the other hand, many things have to be taken on face value: program code is a black-box for anyone but the programmer, only the client understands the real needs for the software, only the manager realizes what the real deadlines and constraints are, etc. In this light it may be interesting to delve into the issue of actual organizational practices in IT environment. 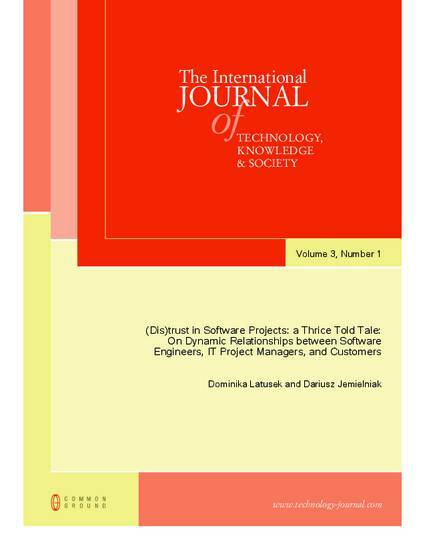 Thus, in this paper we will try to analyze how the trust in software projects is understood, perceived and exercised by the key organizational actors involved. According to our research, there are three major groups of actors in software development: managers, clients, and software engineers. These roles play an important defining function in IT reality. The stories told by our interviewees all point to trust, or rather the distrust in software development. In the proposed paper we would like to confront the three views in an ethnographical manner.